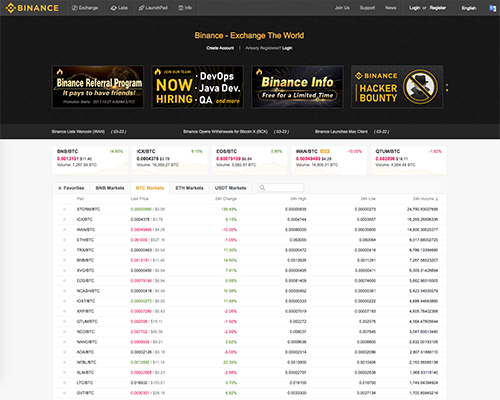 Binance is one of the largest exchanges out there, it's based in Tokyo, China. Binance is an abbreviation of ‘Binary-Finance’, which aptly reveals its identity, and its intentions. It was founded by Changpeng Zhao, who was the former co-founder and CTO of OKcoin, another cryptocurrency exchange based in Beijing, China. Binance is co-founded by Yi He, another member from OKCoin’s founding team, who decided to join Zhao at Binance. The two leaders have a history of working together in cryptocurrency and blockchain based firms, which always bodes well for any new venture. Binance started in mid-2017, and today it is worth $1.1 to $2 billion dollars (difficult to put a figure on the exact amount). Both Zhao and He have close partnership with NEO founders, that is the reason they have offered 0 transaction fees on NEO and NEO-GAS coin on their platform. Given that, it is not surprising how the exchange climbed its way up the rankings, zero fees will always attract customers. The welcoming gesture by investors, was quickly followed by a rise in popularity and an increase in users across the world. This is credited to Binance's lightning speed capability, which makes it able to execute 1.4 million transactions per second. The current user base of Binance is over 4 million, and growing every day. No other decentralised exchange has ever handled such a massive volume with such a quick speed, and with an added layer of security that Binance provides. Lightning fast transactions with user-friendly interface. Minimum information required for registering a Basic account (ID). For an advanced account you might need a government-issued ID, but verification takes less time, and is relatively quicker compared to other exchanges. Maximum security, never been hacked. 2FA is available and can be enabled for an added layer of security. Available across all devices – web, android, WeChat, PC etc. Multi-language support including English, Chinese, Japanese, Korean. Binance Labs – a co-venture of Binance Cryptocurrency Exchange, hosts an array of services. They help other start-ups with assistance, funding, resources and advisory. It has kept Binance in the news, again boosting its credibility. To upcoming tokens, they provide a launch-pad that gives them quick visibility for their pre-sale and incubation period. Trading Fees is 0.1% which is one of the lowest in the world. It can be further halved if you use Binance Coin (BNB) to trade. Transaction fees depends on the cryptocurrency you want to buy or sell. It also depends upon the blockchain conditions. Currently, transaction fees for Bitcoin is 0.001 BTC and for Ethereum it is 0.01 ETH, while for NEO and Neo-GAS it is 0. Binance is supported worldwide, and its easy interface makes it possible for international investors to contribute and trade freely. For mobile app, an API private key can be generated to access Binance via third-party websites or applications. Binance acts as a wallet to store your crypto-assets, as it has advanced security protocols. The biggest disadvantage of Binance is that it does not provide Fiat/Cryptocurrency pairing as of now. There are only cryptocurrencies available, and the pairs are only of crypto-assets. If you want to buy cryptocurrency using USD or any other Fiat currency, you will need to go elsewhere. On Binance, you first need to deposit your cryptocurrency, only then you can start trading. Hence, PayPal is useless for Binance. The application for iOS is not listed in Apple Store, but users can still download it from official Binance-website, by downloading an IPA File. The interface of Basic view is easier but if you switch to Advanced view, it can be tough to understand. The complex interface of Advanced view has repelled users and forced them to switch back to Basic version. Only seasoned traders appear to be comfortable with Advanced version. Android version of the Binance mobile app might be available in Google Play Store, but users have reported difficulty in usage. Binance stores some data, like logging IP addresses from the users’ devices. You cannot buy in bulk through Binance, if you want to drop over $100,000, Binance is not for you. Try CryptoGo. Since it is based in China, the risk of Chinese government’s behaviour towards cryptocurrency always stands with a fearful stance. Once you are on the page, it's very simple. Click on "Register" at the top right of the page or "Create an account" in the center. Vous allez devoir entrer votre adresse E-mail et choisir un mot de passe. Un E-mail avec un lien de confirmation vous sera envoyé sur votre adresse. You can enable additional security on your account by activating what is called 2FA (2-factor identification). You can activate 2FA on Binance with Google Authenticator (more info on Wikipedia). If you do not want to do it for the moment, you can click on "Skip for now" and activate it later. Now that you're signed in, you can deposit Bitcoin, or another Cryptocurrency into your Binance account. To do this, click on "Funds" at the top of the page, and choose "Deposits Withdrawals". In this example, we will choose to deposit Bitcoin. It will be necessary to click on the button "Deposit" to the right of the currency in question. You can search your currency directly in the list or use the search tool located at the top left. After clicking Deposit, you will see the deposit address on which you will be able to send change (here Bitcoin). Now that you have made a deposit on Binance, you can start trading. Click on "Market" at the top left of your screen, then choose Basic or Advanced. I advise using "Basic" unless you are familiar with trading. The page may seem complex at first glance, but once you understand it is very easy. We must first choose the market on which we will trade, top right (in red on the photo). You can trade currencies against Bitcoin (BTC), Ethereum (ETH), Binance Coin (BNB) or Tether (USDT). In this example, we will choose BTC. Just below, you can see the list of currencies that can be traded against the BTC. Click on the currency you want to buy or sell. There is also an option to search for the currency you want (in orange on the photo). You can see the chosen currency at the top left (in green on the photo), as well as the current price next door. In this example, we will buy Binance Coin (BNB) with Bitcoin (BTC). If you choose "Limit", it will then fix its price, and then choose the amount you want to buy (or sell). With "Market", you just have to choose the amount.You will see below the total sum of the purchase / sale (here in BTC). As for the "Stop-Limit", we will approach it in the following image. The Stop-Limit allows him to set a price from which one would be ready to buy. The Stop box allows you to set a price, from which your order (Limit) is automatically passed. The Limit box will be your buy / sell order, which will be posted as soon as the Stop price is reached. I have 1 Binance Coin (BNB), whose price is 0.000400 BTC. Let's say I bought it at 0.000200 and thus doubled my investment. To make sure, I would like to sell it automatically if the price goes below 0.000350 BTC. So I put in Stop 0.000350 and in Limit a slightly lower sum: 0.000345. In Amount, I enter the number of BNBs that I want to sell (here 1). If the last price is equal or lower than 0.000350 BTC, my order of sale to 0.000345 BTC will be directly placed and could thus allow me to limit the breakage. It is also possible to do the same for purchases.